I was recently asked to participate in a committee at Congregation Beth Torah whose purpose is to develop a networking group for all business professionals. As many of you know, I love to socialize and I love to help others, so I did not hesitate at all in accepting the invitation. 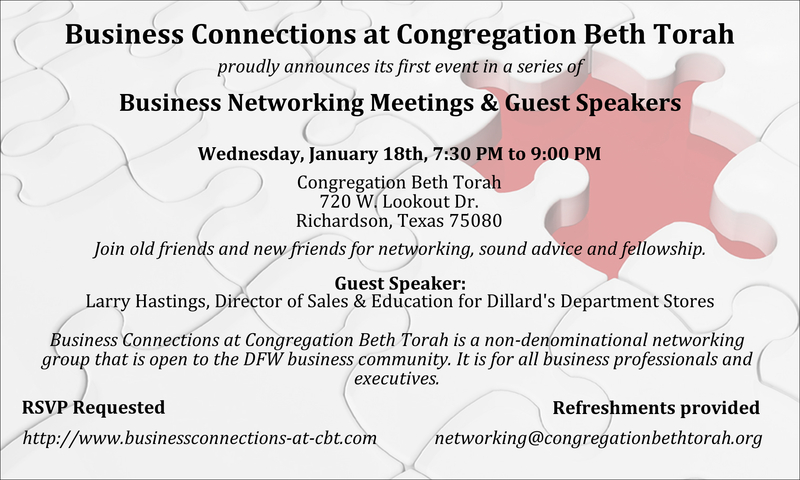 Business Connections at Congregation Beth Torah is a non-denominational networking group that is open to the DFW business community. It is for all business professionals and executives. Join old friends and new friends for networking, sound advice, and fellowship.